Wyoming is facing challenging times with the slow in energy production, but one industry is rising to the challenge in Fremont County: tourism. The travel and hospitality industry is the second-largest industry in the Cowboy State and will be increasingly important in coming years. The Wyoming Office of Tourism released its study of tourism’s impact on the state’s economy last week. Both travel spending and travel-generated employment in the state have grown steadily in the past 15 years, and in 2015 visitors spent $3.3 billion, generating $170 million in state and local taxes. 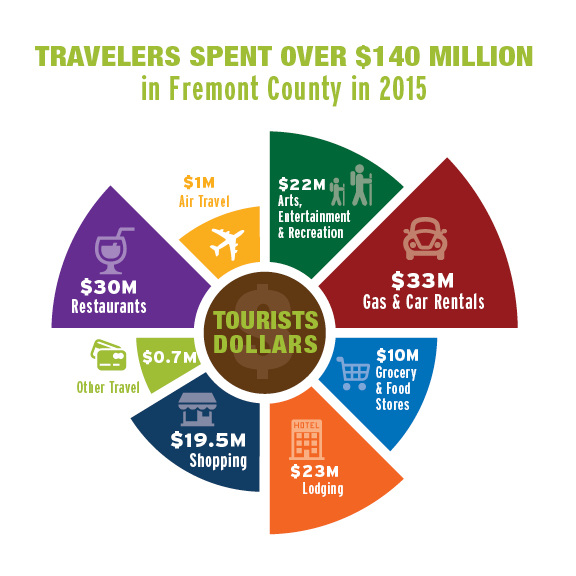 Fremont County’s 2015 numbers are particularly encouraging. Despite a significant drop in gas prices last year, Fremont County/Wind River Country was one of five Wyoming counties that saw positive growth in travel spending; the county saw the third highest growth behind tourism-heavy Park and Teton counties. “Visitors traveling to and throughout Wyoming represent an important component of the state's economy,” the Wyoming Office of Tourism’s report states. That will only become more important in 2016, and Wind River Country is primed for the opportunity to offset lean years in other aspects of the budget. The Wind River Visitors Council’s mission is to stimulate tourism by increasing awareness of, and encouraging visitation to, the unique destinations, activities and events in Fremont County/Wind River Country, Wyoming. The Wind River Visitors Council (WRVC) is a Lodging Tax Board responsible for promoting the travel and tourism industry in Wind River Country through expenditures of the Lodging Tax. WRVC Board members represent our communities and the county and are appointed by local City Councils and the Fremont County Commissioners. Learn more at windriver.org.